Welcome back to Reverse Confetti's January Countdown to Confetti Day Two! This fabulous release has 5 stamp sets, 6 dies and a beautiful pattern paper pad! 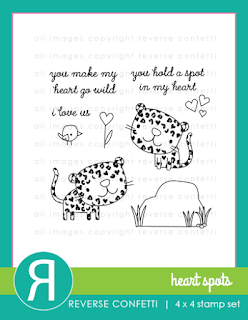 The Heart Spots set/dies introduces two oh-so-cute cheetah images, darling coordinating images and super sweet sentiments...can you say 'eeekkk'!! 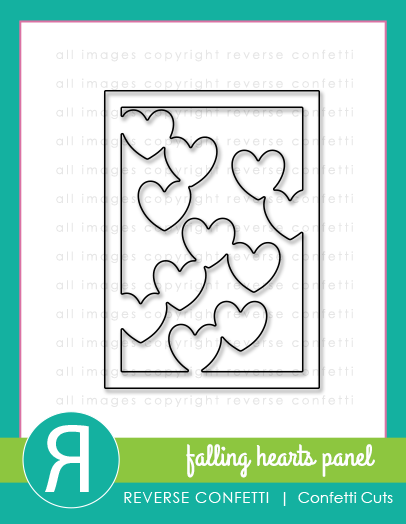 For my cards, I used the new Falling Hearts Panel. First, I created a watercolored background and cut it with the panel die. 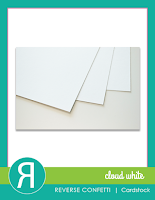 I then used the panel die to cut Cloud White cardstock and laid in the cut watercolored piece (see card on the right below). 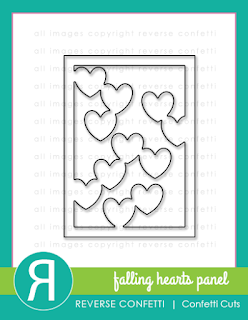 Then, I cut Midnight cardstock with the Falling Hearts Panel die, placed the hearts that were cut from the watercolored background piece over that and 'filled in' the rest with the remaining Cloud White cut piece (see card on the left below). 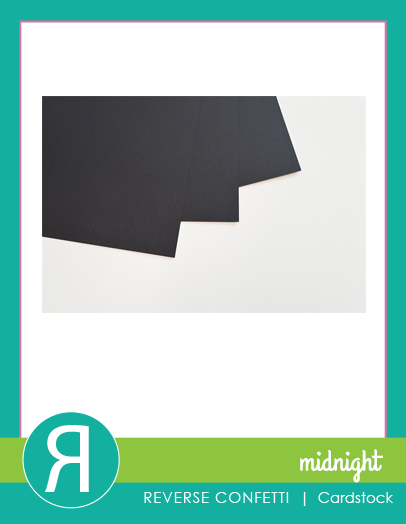 The sentiments are gold embossed on Midnight cardstock. 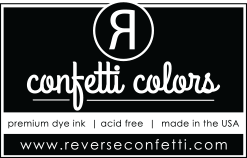 Come back tomorrow for Countdown to Confetti Day Three for more sneak peeks of the January release! What an awesome background!! I love how you used the negative and positive diecuts to create these wonderful cards. Oh, these are so sweet! 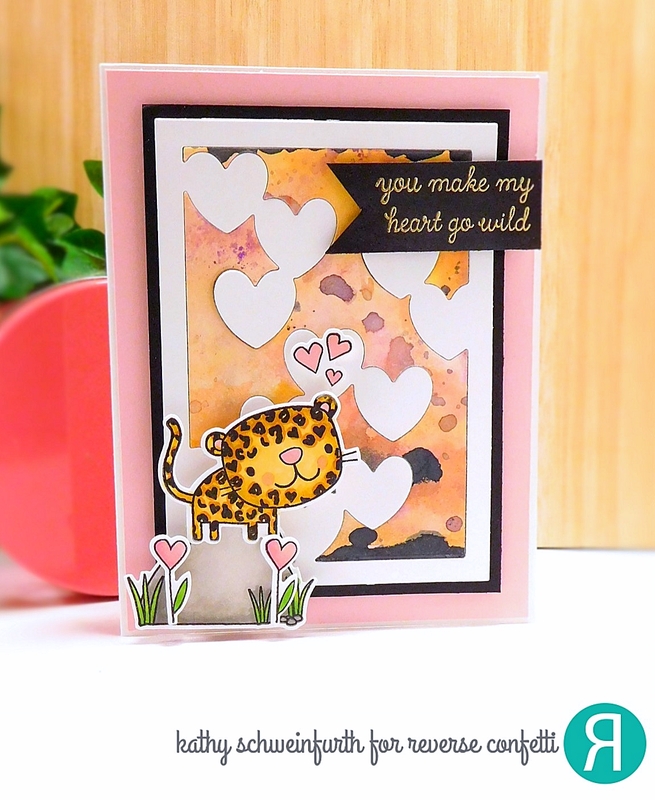 Love the Falling Hearts panel paired with the cheetahs and your water coloring, this is a beauty, Kathy! The watercolored panels are amazing with your cheetahs, so perfect! You used the perfect watercolors! Your two-for-one watercolored background use is brilliant! Love the backgrounds you created for these sweet cards! Love how you used the die for two cards and both of them are absolutely stunning!!! Your colors really go so nicely together! Beautiful! I LOVE these loving leopards! 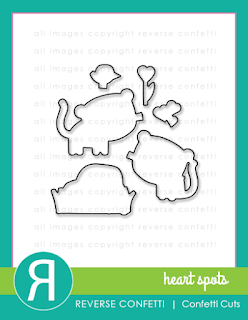 These are super cute, and I love that fun background color too! This looks amazing! and the awesome falling hearts panel. Gorgeous cards, Kathy. Adorable! 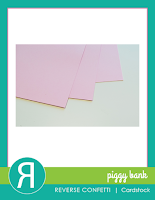 Love your fun and fabulous cards and this new release. Gorgeous cards! Love the 2-for-1 bonus by creating one pretty watercolored panel. Beautiful cards! Your backgrounds are fabulous! Your color combo is lovely. The watercolored background looks like sunset on the savannah. You make MY heart go wild. Great card! Fabulous cards. I like how you got two cards from the watercolored panel. So cute!!! Love your design, colors, patterns, and characters. I love the use of positive and negative die cuts. And that touch of gold emboss on black is very pretty. Just lovely. Happy New Year! 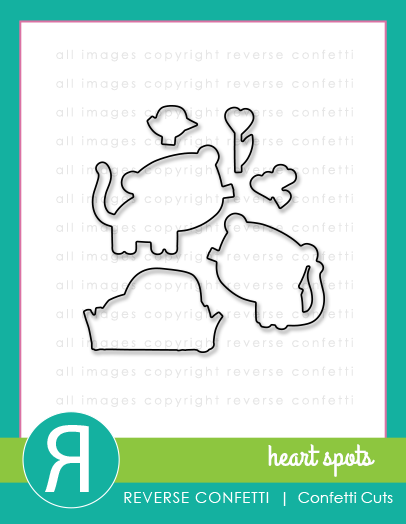 What a great take on this absolutely adorable set! 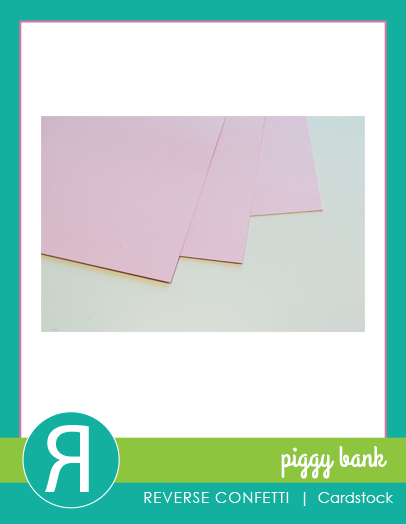 Very pretty way to use this die cut panel on two cards...adorable. Really like the falling hearts with the watercolour background. Cute watercolor background! The leopards are fun and unique and I really like the sentiments. Clever use of positive and negative pieces of the die cuts. The little leopards are so cute!